Winter oh winter at this point I can only dream for your beloved friend mr. snow. Let’s keep it like that shall we. It’s not that I don’t like it when it snows, but all the disadvantages it has when I’m not in the best of moods. Oh, god. However, today it’s not about the weather but about a new tea I have just bought and tasted. And Yes you’ve guessed right! It’s called Winter Dream. 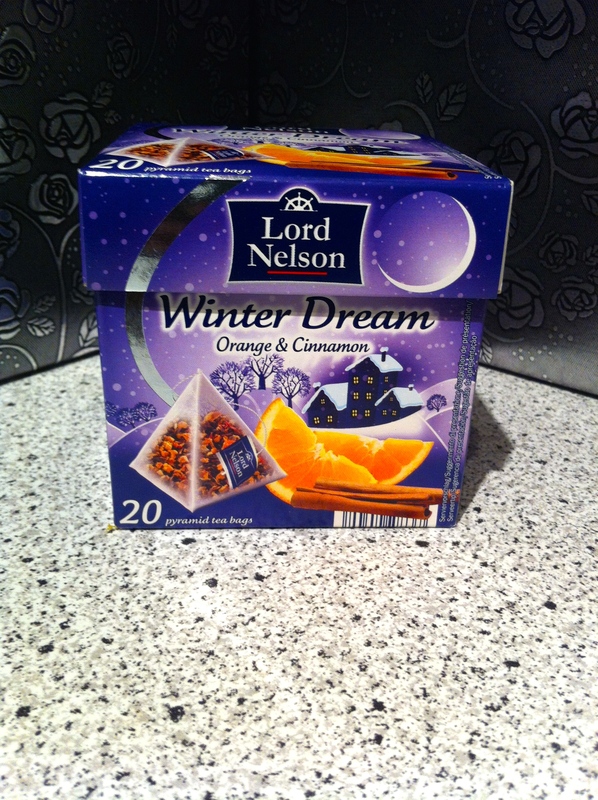 I bought this at my local Liddle store and it claims that it’s main ingredients are orange and cinnamon. I was very curious because I don’t drink lots of teas that have orange in it. Before opening this tea and removing the plastic I sniffed it first (nope not a doggy sniff haha). It smells like something really spicy and not spicy as in pepper spicy but as in cinnamon spicy. So I have to admit that it atleast smells like cinnamon. Most teas do smell like cinnamon but they then have some sort of mellow soft smell. This tea smells so spicy because it’s mixed with orange which already has a very strong aroma on itself. After adding boiling hot water to the tea a purple(ish) color comes free. It’s original color slowly spreads throughout the whole tea cup. I really like colored teas you know and the way the color develops as it steeps. It’s like watching a slowmotion video. 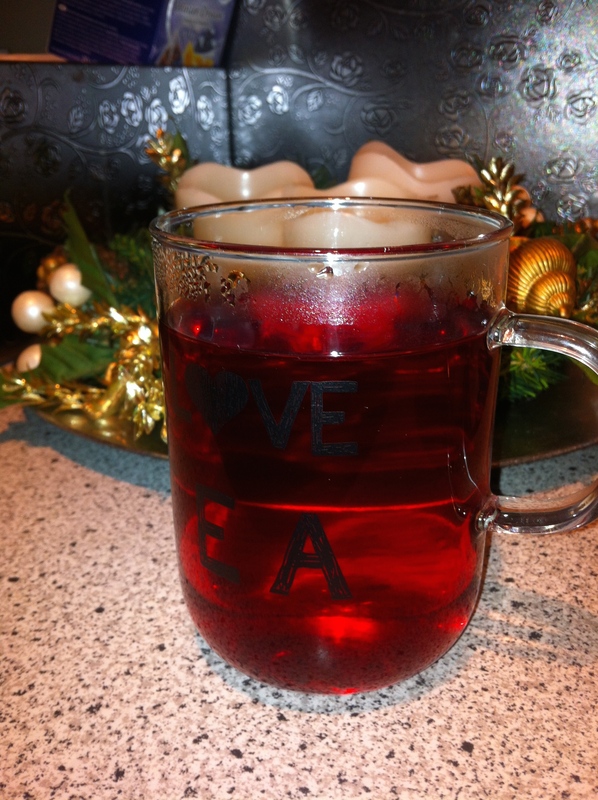 And this is the finished result a burgundy red tea. How does it taste? I don’t know what the aroma of hibiscus is like because at Hause Marustan we don’t cook with that. The taste is actually a mix of both cinnamon and orange. It isn’t the orange that I ussually eat or drink but I think it’s an orange extract. I am actually a bit dissapointed in this one because it does not have a lasting affect. Mostly when I drink teas of this brand it does have a lasting affect and they smell the same way as they taste. Unfortunately it’s not the same for this tea but I do like that it has a sour taste to it/ For days I’ve been searching for a sour tasting tea which is not lemon * I am a bit tired of lemon tea* and finally I’ve found it.